Part of the challenge of cooking is to make something unpromising into something worth eating. 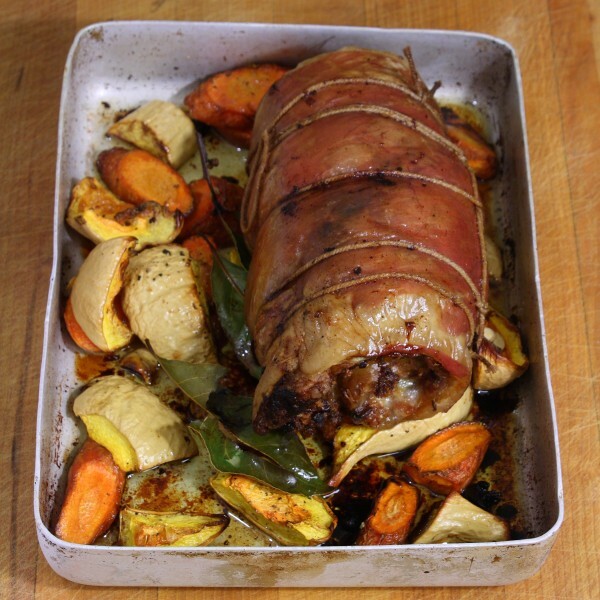 There are few cuts of meat that present as little to the cook as a breast of lamb. Let’s be frank here. This is not an appetising cut. It looks fatty, skinny, full of gristle and just plain unappealing. On top of all that, it’s a funny shape. The butcher let out a small gasp when I asked for a lamb breast, before regaining her composure and selling it to me as quickly as she possibly could, in case I changed my mind at the last minute. She charged me £2.50, but I got the impression she’d have taken anything just to get rid of it. I had a recipe in mind. Nobody buys a breast of lamb just on a whim. This recipe does two things – it packages the breast up into a neat roasting joint, and it allows the lamb to cook slowly and gently, rendering away all of that fat, basting and protecting the meat. A tough cut is slowly lulled into tenderness. The results are astounding, and at less than £3 on the table, it’s a complete bargain. The breast is going to be stuffed and rolled, so ask the butcher to remove the rib bones for you. They’ll be delighted to do this for you. Anything to get a sale. At home, mix 75g of fresh breadcrumbs, 75g of chopped dried apricots, half a tablespoon of fresh thyme leaves and the zest of one and a half lemons together in a bowl. Season genorously with salt and pepper and add enough beaten egg to bind the mix together loosely. Spread the stuffing mix out onto the lamb breast and roll it up tightly, starting from the thin end. Do this slowly, and push the stuffing back into place if it falls out of the sides. Tie the rolled joint up with three or four lengths of string. My joint-tying skills are very haphazard, as is evident above. If anybody out there knows how to do this sort of thing properly, I’d be very willing to learn. Just do the best you can. Put the lamb in a roasting tray and cook in a 200c oven for half an hour to get a nice colour on the meat, then turn the temperature down to 150c. At this point, lift the joint out of the tray and add some root vegetables, potatoes, squash, carrots, celeriac, whatever you have handy, cut into hefty chunks, tossed around in the fat and seasoned. A couple of bay leaves help, if you have them. Place the meat back on top. Return the tray to the cooler oven and cook for a further hour and a half, basting the meat every now and again. Let the meat rest for ten minutes before carving into thick discs and serving with the vegetables. The meat will be tender, balanced by the sweetness of the apricots and the earthiness of the thyme. The vegetables will have soaked up their fair share of the meat juices, soft underneath, crisp on the top. This is a warming, autumnal plate of food. This recipe is from Hugh Feanley-Whittingstall’s new book, River Cottage Everyday. Hugh cooks two breasts, enough for four. All I’ve done here is roughly halve the ingredients for the stuffing, although it’s not an exact science by any means. It looks positively lovely. I'm not familiar with lamb breast, but what a great way to implement "nose to toe" eating (not to mention eating on a budget)! Looks great! I am purchasing a whole lamb in December, and this will be the perfect way to serve the breast. Thank you! I always see this cheap cut of lamb meat in the supermarket. Didn't know what to do with it. I bought once and make stew out of it. Not too bad. But your recipe here sounds very delicious. Thanks for sharing. I love almost anything with dried apricots… this looks wonderful! This is a really nice recipe and does not look to difficult — just the way I like it! Oh I love dried apricots. Looks great! This is beautiful! How brave of you to use this cut that was apparently shunned by the butcher. Lamb is not too popular except in restaurants. Hope to try this one day most especially the stuffing. This is a great keeper!! Thanks for sharing the info and the picture made me hungry! Looks delicious. These cuts have all the flavour don't they? I cooked stuffed lambs hearts for the first time this week – can't believe I've not done so before. They were great, like a cross between liver and pate and you end up with a lovely rich gravy. Very fatty though, so they need cooking the day before to take all the fat off which solidifies on the top. You've turned an ugly duckling into a beautiful swan! A beautiful, delicious swan. Great job on using budget-friendly, lesser-used cuts of meat. It's easy to make a top quality cut of meat taste good, but it takes real skill to take a cut that has more challenges to it, and make something truly wonderful out of it. The finished roast looks amazing! I've just come from the table where my wife and I supped this truly downright delicious recipe that has once and for all dispelled my fears of this gnarly looking cut – the humble yet glorious Lamb Breast. Rich, I made this tonight and it was superb. It was absolutely delicious and a revelation. I'm a total supporter of nose to tail cooking – mainly because in exploring all those cuts of and inbetween you come across some total worthwhile gems! Thank you for writing up this recipe. Its a firm favourite now of all the recipes I have made from blogs, my partner (who grew up in Saltaire!) wants me to make it again next week and, at £3 I can barely afford not to! I absolutely adore your blog. Its fantastic, informative, passionate and beautiful. Keep up the good work and cheers once again for this magical recipe. Thanks very much – that's very kind of you. I love this recipe, too – it's incredible that you can make something so, well, scratty and unpromising into something quite so good. I'm going to prep a couple tonight and freeze one, just to see how that goes. I like the idea of a zero effort, pre-prepped roast, freezer-defrost-oven-table type meal every now and again. Just in case of emergencies, or lack of inspiration. Below is my late Mum’s recipe for lambs’ hearts, very popular in WWII if you could get hold of any. I loved it as a child in the 1950s. Clean out four lambs hearts removing the grissly bits, mainly the valves. Stuff with ordinary sage and onion stuffing. Slice rounds of two – three large carrots into a small casserole, add one onion coarsly chopped. season with salt and pepper. Add the lamb hearts lying on their sides, and enough water to cover the bottom of the dish to about half an inch deep. Cover and cook slowly in the oven (150-170 C) for two to three hours until tender. Top the water up at intervals and turn the hearts so they do not dry out. One should be left with a thick gravy containing bits of the stuffing. Serve with potatoes and a green vegetable.